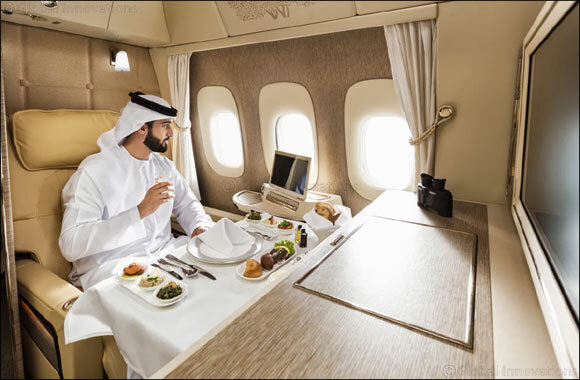 April 14, 2019: In a move to offer a range of experiences and greater choice for its customers travelling for business and leisure, Emirates will be operating its latest Boeing 777-300ER aircraft fitted with the ‘Game Changer' First Class suites from Dubai to Riyadh starting from 16 April 2019 and Kuwait starting from 1 June 2019. Adil Al Ghaith, Senior Vice President Commercial Operations Gulf, Middle East & Iran said: “The Kingdom of Saudi Arabia and Kuwait will be the first countries in the Middle East and GCC to be served by the latest Emirates Boeing 777 aircraft featuring fully -enclosed private suites inspired by luxury automaker Mercedes-Benz. Travellers to/from Saudi Arabia can experience the new Boeing 777 product on flight EK 819 departing Dubai at 0655hrs, arriving in Riyadh at 0750hrs. The return flight EK 820 leaves Riyadh at 0935hrs, arriving in Dubai at 1230hrs. The new Boeing 777 aircraft will begin operating the route five times a week, and from 1 June 2019 will begin flying on a daily basis. Customers flying on the latest Emirates Boeing 777 are then able to enjoy seamless connections via Dubai to London Heathrow, Paris, Madrid, New York JFK, Hyderabad, Barcelona, Los Angeles, Geneva and Amsterdam. Emirates will be expanding its premium Boeing 777 experience to/from Kuwait on EK 855, which departs Dubai at 0745hrs, arriving in Kuwait at 0825hrs. The return flight EK 856 leaves Kuwait at 0950hrs, arriving in Dubai at 1240hrs. The service will operate daily to Kuwait. The Dubai-Kuwait route was ranked one of the 'World's 20 Busiest Routes', according to OAG Aviation, and is the busiest route across the Middle East and North Africa. From First Class through to the Business and Economy Class cabins, the latest Emirates 777 aircraft features ergonomically designed seats, multi-million dollar upgrades and the latest version of the ice inflight entertainment system across all cabins. Designed with an emphasis on exceptional customer comfort and the ultimate in privacy, Emirates ‘Game-Changing’ Boeing 777 private suites feature floor-to-ceiling sliding doors and ultra-modern design features against cool grey colourscapes. Offering up to 40 square feet of personal space each, the spacious, fully-enclosed private suites are laid out in a 1-1-1 configuration, for a total of six suites. The new suites include seats that recline into a fully flat-bed that manoeuvres into multiple positions and can be placed in a “zero-gravity” state inspired by NASA technology, for a feeling of weightlessness while flying. Passengers can also choose from a multitude of lighting colours and adjust the temperature of their suites for a fully customisable experience. The industry’s first virtual windows can be experienced by customers seated in suites located in the middle aisle. The virtual windows project a view from outside the aircraft using real time fibre-optic camera technology. Emirates also provides binoculars to customers who want to explore the vistas and cities below during their journey. Customers in each suite can also seamlessly communicate with the cabin crew or request room service and in-suite dining through an innovative video call function. The Business Class seats are inspired by the interior of a modern sports car, and feature an ergonomically designed headrest with a sleek look and feel. Business Class passengers can also customise their experience with touchscreen controls for their seat and inflight entertainment system and adjust their personal lighting options. The cabin also includes privacy panels between seats, a shoe stowage area, footrest, and a personal mini-bar. The Economy Class cabin features a colour palette of soft greys and blues. The ergonomic seats come with full leather flexible headrests with side panels that can be adjusted vertically for optimum support. Emirates operates to Riyadh with four flights a day and to Kuwait with six daily flights. Currently, the airline operates its latest Boeing 777-300ER aircraft fitted with the ‘Game Changer' First Class suites to Brussels, Geneva, Vienna and London Stansted. Emirates is the world’s largest operator of the Boeing 777 family of aircraft, flying over 160 of these modern and efficient wide-bodies to six continents from its Dubai hub. Turkish Airlines brings a new elegant style to the skies with its new cabin crew uniforms.